I’ve been working on hand quilting this quilt. It’s been relaxing evening work while watching to (more like listening to) the television. I love hand quilting. It’s a good opportunity to get “back to the basics” and work on perfecting that tiny, regular stitch that I love so much. This quilt is coming right along, and I’m happy with it thus far. I’m not sure how I want to quilt the borders yet. Any ideas? Please share! The border ends about two inches from the bottom of the yellow bows, so there’s not a lot there to play with. 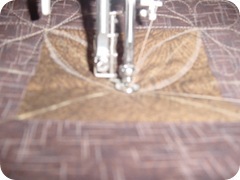 During the day on my week-long vacation I’ve been in the basement working on my machine quilting. I’ve only been machine quilting since July, and there is a large learning curve. My mom was a seamstress, and when she was teaching me how to sew she said over and over “Don’t watch the needle!” I’ve always followed that logic, but it doesn’t work when machine quilting. I’m learning how to follow a chalk lined pattern, as well as how to free-form quilt. It’s not as easy as it looks. 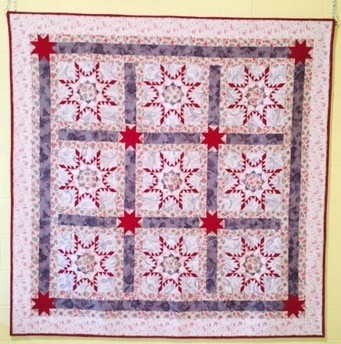 I use a Pfaff Hobby Grand Quilter which I love for piecing. On the frame, I am still getting used to her (Millie is her name). If you look at the photo (right), you are looking at the needle area as I see it from sitting on a bar stool. I have made the chalk lines in the beige square darker so you can see them. See the two melons in the top part of the square? Now look at the needle shank area. Doing the left melon is difficult going backwards because of that huge glob of metal that blocks my vision. How do you get around that? Is there a smaller shank that can be used so you can see more of the fabric? I’m doing the feathers/daisies (or whatever you want to call them) in the corner pretty much freestyle. I’m learning, but it’s hard to get each one to look identical. As you can clearly see here. I’d like them to look the same size. I am using an 80/20 batting so that when the quilt is washed, it will pucker up. I love that look. 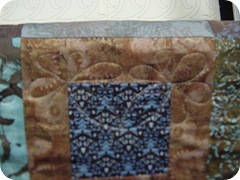 Do you think the difference in the quilting on the corners will be as obvious when it’s washed? I need some feedback please, friends. I’ve been visiting the Sharon Schamber website and looking at her free videos. She has a larger website with other more explicit instruction, but it requires payment of a fee. I think she’s smart to do that!!! I could really benefit from some quality instruction but don’t often get to big quilt shows where instructors teach these kinds of classes. If you’ve participated as a payer on her website, I’d love some feedback from that as well. I need to be able to justify spending money right now with this economy the way it is. I know you feel the pinch as well. 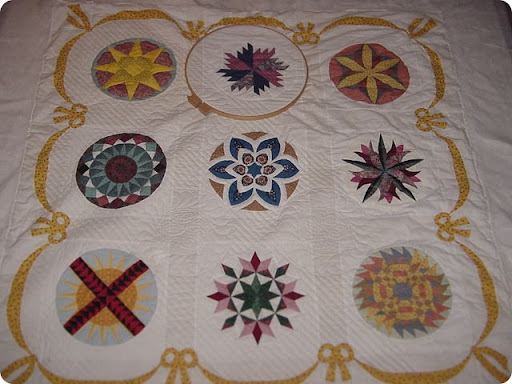 If you know of another source for good machine quilting instruction, I’d love it if you’d share that as well. Off to the basement. Hello, Millie. Play nicely!